In this article, let’s learn about different types of flip flops used in digital electronics. This article deals with the basic flip flop circuits like S-R Flip Flop, J-K Flip Flop, D Flip Flop, and T Flip Flop along with truth tables and their corresponding circuit symbols. Before going to the topic it is important that you get knowledge of its basics. Click on the links below for more information. Flip flops are actually an application of logic gates. With the help of Boolean logic you can create memory with them. Flip flops can also be considered as the most basic idea of a Random Access Memory [RAM]. When a certain input value is given to them, they will be remembered and executed, if the logic gates are designed correctly. A higher application of flip flops is helpful in designing better electronic circuits. The most commonly used application of flip flops is in the implementation of a feedback circuit. As a memory relies on the feedback concept, flip flops can be used to design it. The SET-RESET flip flop is designed with the help of two NOR gates and also two NAND gates. These flip flops are also called S-R Latch. The design of such a flip flop includes two inputs, called the SET [S] and RESET [R]. There are also two outputs, Q and Q’. The diagram and truth table is shown below. This state is also called the SET state. This state is known as the RESET state. In both the states you can see that the outputs are just compliments of each other and that the value of Q follows the value of S.
If both the values of S and R are switched to 0, then the circuit remembers the value of S and R in their previous state. This is an invalid state because the values of both Q and Qâ€™ are 0. They are supposed to be compliments of each other. Normally, this state must be avoided. 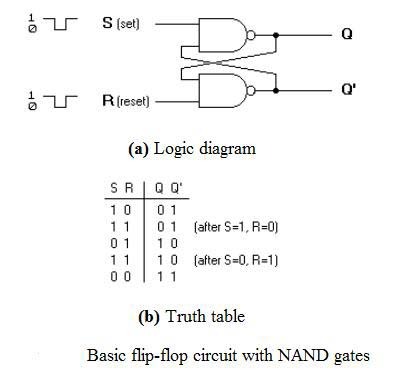 The circuit of the S-R flip flop using NAND Gate and its truth table is shown below. In both the states you can see that the outputs are just compliments of each other and that the value of Q follows the compliment value of S.
If both the values of S and R are switched to 0 it is an invalid state because the values of both Q and Qâ€™ are 1. They are supposed to be compliments of each other. Normally, this state must be avoided. If both the values of S and R are switched to 1, then the circuit remembers the value of S and R in their previous state. It is also called a Gated S-R flip flop. 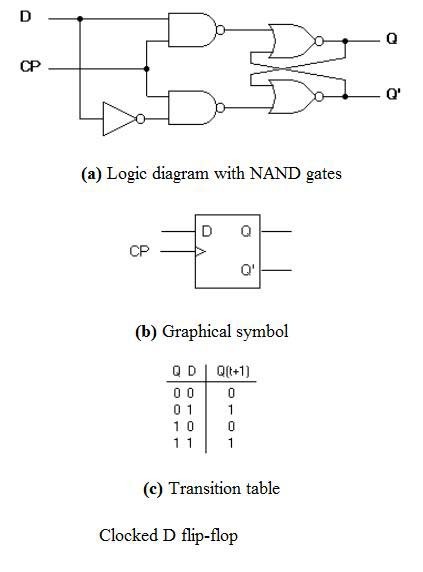 The problems with S-R flip flops using NOR and NAND gate is the invalid state. This problem can be overcome by using a bistable SR flip-flop that can change outputs when certain invalid states are met, regardless of the condition of either the Set or the Reset inputs. For this, a clocked S-R flip flop is designed by adding two AND gates to a basic NOR Gate flip flop. 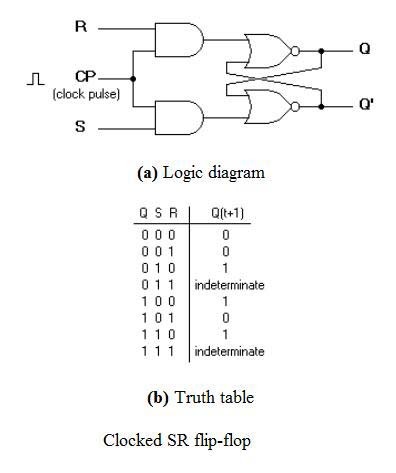 The circuit diagram and truth table is shown below. A clock pulse [CP] is given to the inputs of the AND Gate. When the value of the clock pulse is ‘0’, the outputs of both the AND Gates remain ‘0’. As soon as a pulse is given the value of CP turns ‘1’. This makes the values at S and R to pass through the NOR Gate flip flop. But when the values of both S and R values turn ‘1’, the HIGH value of CP causes both of them to turn to ‘0’ for a short moment. As soon as the pulse is removed, the flip flop state becomes intermediate. Thus either of the two states may be caused, and it depends on whether the set or reset input of the flip-flop remains a ‘1’ longer than the transition to ‘0’ at the end of the pulse. Thus the invalid states can be eliminated. 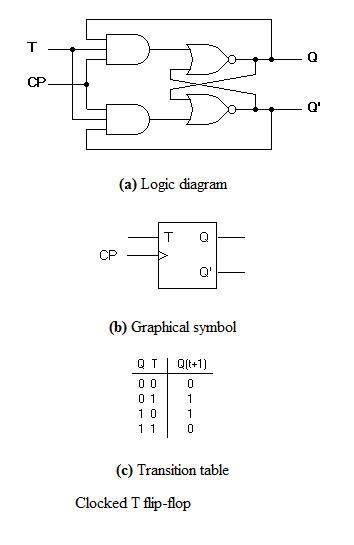 The circuit diagram and truth table is given below. D flip flop is actually a slight modification of the above explained clocked SR flip-flop. From the figure you can see that the D input is connected to the S input and the complement of the D input is connected to the R input. The D input is passed on to the flip flop when the value of CP is ‘1’. When CP is HIGH, the flip flop moves to the SET state. If it is ‘0’, the flip flop switches to the CLEAR state. To know more about the triggering of flip flop click on the link below. 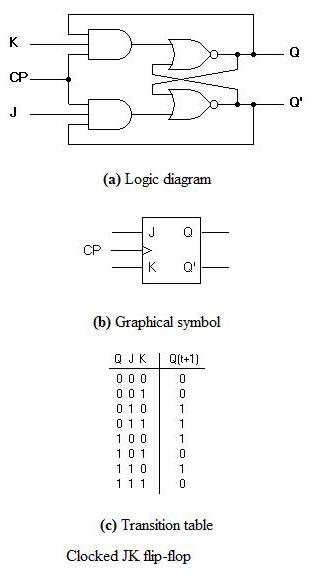 The circuit diagram and truth-table of a J-K flip flop is shown below. A J-K flip flop can also be defined as a modification of the S-R flip flop. The only difference is that the intermediate state is more refined and preciseÂ than that ofÂ a S-R flip flop. The behavior ofÂ inputs J and K is same as the S and R inputs of the S-R flip flop. The letter J stands for SET and the letter K stands for CLEAR. When both the inputs J and K have a HIGH state, the flip-flop switch to the complement state. So, for a value of Q = 1, it switches to Q=0 and for a value of Q = 0, it switches to Q=1. The circuit includes two 3-input AND gates. The output Q of the flip flop is returned back as a feedback to the input of the AND along with other inputs like K and clock pulse [CP]. So,Â if the value of CP is ‘1’, the flip flop gets a CLEAR signal and with the condition that the value of Q was earlier 1. Similarly output Qâ€™ of the flip flop is given as a feedback to the input of the AND along with other inputs like J and clock pulse [CP]. So the output becomes SET when the value of CP is 1 only if the value of Qâ€™ was earlier 1. The output may be repeated in transitions once they have been complimented for J=K=1 because of the feedback connection in the JK flip-flop. This can be avoided by setting a time duration lesser than the propagation delay through the flip-flop. The restriction on the pulse width can be eliminated with a master-slave or edge-triggered construction. This is a much simpler version of the J-K flip flop. Both the J and K inputs are connected together and thus are also called a single input J-K flip flop. When clock pulse is given to the flip flop, the output begins to toggle. Here also the restriction on the pulse width can be eliminated with a master-slave or edge-triggered construction. Take a look at the circuit and truth table below. Concise explanation of flu flops. Quite different altogether to the one I was thought in college. Very gooÉ— article! We are linking to this great post on our website. Hi. Thanks for this thought provoking article, didn’t really read it but did remind me to go out and by some flip flops. i want to know that how the truth table is formed while designing a clocked s-r flipflop???? how y1 ,y2 i.e.o/p of decoder is occur??? Like the in depth explanations. And is willing to post it ?. Good explained, But my question is how to build a RS-Flipflop from a truth table . I mean that , it is rather like a combinational logic. This is very good explanation of Flip-Flop. 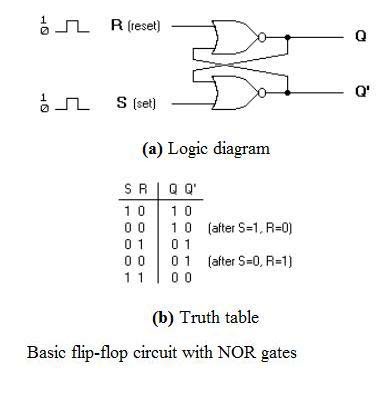 But my question is, how we could make a rs flip-flop from a truth table , assuming that we havent seen the circuit before or if we have to design a circuit? How to design a sequential logic circuit at all? Shouldn’t there be an inverter on that T flip flop between T and one of the and gates? Thank u its very usefull……………. I need merits and demerits of each filp-flops..
Hii explanation ni fupi tena clr. Love it. sweet and short. Good for revising for exams especially when you study hours before the exam. iknow im not the only one! In Clocked R S flip,Somewhere Two AND gate with clock or Two NAND gate with clock pulse used.But problem is that what is the logic behind of Gate use. Same thing happen D flip flop. Its seems that there is an error on the D flip flop Drowing, eather change tha NAND gates to AND, or the NOR to NAND. I try to found Excitation table for flipflop but i could not… :(..!!! so try to add this point to….!!! i want pin no.s for above fig. thanks for information about flip flop in simple lang. j.k ff’s structure is WRONG!!!!! There are three edge-triggered flip-flops namely SR, D and J-K that are used in digital logic circuits and every flip-flop has its own operation. State that how these flip-flops can have an effect on the performance of synchronous systems, and also discuss which flip-flop gives better performance? Give arguments in the support of your answer. Sala mal tui master slave er nor gate diye ckt diagram disnai keno ? what’s the relation between pulse width and output response of the flip flop. What’s are the gates responsible for Subtraction, Division…of Bit? Since Half Adder Admit Two Bits & Sum And Full Adder Admit Two Bits, Sum And A Carry Bit? go buy a MORIS MANO..
What is the use of flip flop.and what is mean by clock pulse? thanq very much…these are very helpful answers.